Born just South of Seattle, in Tacoma, Washington, pioneer glass sculptor Dale Chihuly is known in the art world for his highly technical, larger than life installations and his unique ability to blend sculptures into their surrounding environments. He’s exhibited his work everywhere from Israel to the Netherlands to Toronto, but opened Chihuly Garden & Glass in Seattle Center in 2012 to honor his Northwest roots. Here are some of our favorite aspects of his colorful, playful glass paradise. Drawing inspiration from two of his favorite architectural masterpieces, Paris’s Saint-Chapelle and London’s Crystal Palace, Chihuly dreamed up “The Glasshouse,” a gorgeous home for one of his largest installations. In this exhibit, delicate ribbons of yellow, orange and red glass discs—reminiscent of flowers—seem to float across the ceiling, catching sunlight, and forcing guests’ gazes upwards in awe. Chihuly’s glass garden ornaments and sculptures create a landscape that feels straight out of Alice and Wonderland. 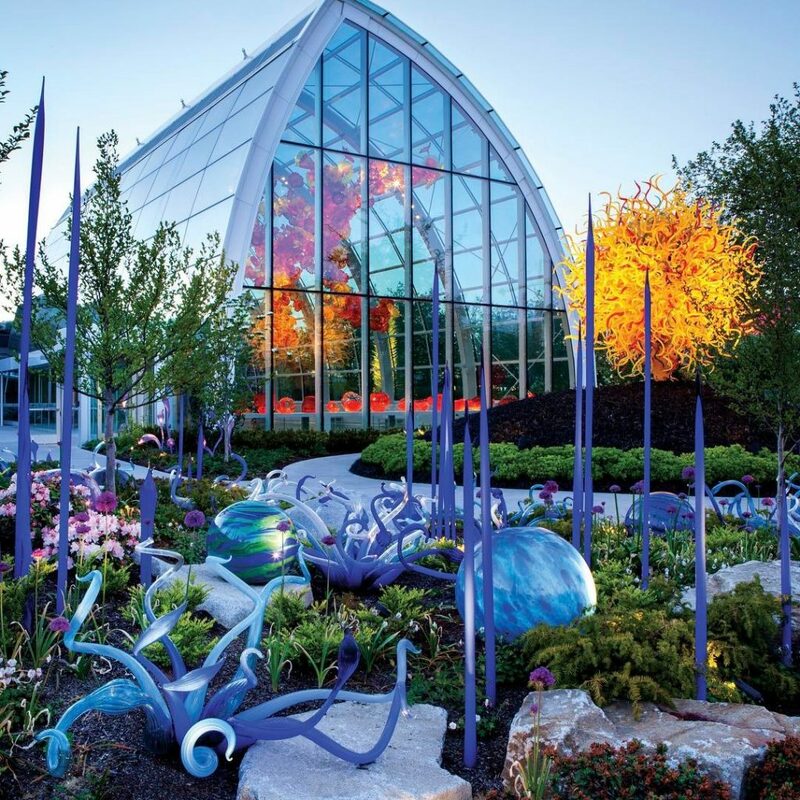 A collaboration between Chihuly and local landscape architecture firm AHBL, each piece is whimsical, clever and vibrant, simultaneously blending in and sticking out from its verdant surroundings. At Collections Café, accordions hang from the ceiling, a variety of old-school radios line a portion of one wall, and each glass table top covers a centerpiece of vintage gadgets and toys. The Café serves up creative, locally sourced soups, salads and sandwiches, and provides a cozy, if quirky, place for guests to rest after browsing the garden and glass house. Chihuly’s exhibits sprawl out across nearly two acres in Seattle Center, and are just a few paces away from The Space Needle. Visitors rave about looking up at Chihuly’s sculpture in the glass house, and seeing the tip of the Space Needle floating between the colorful, suspended discs. The discs almost mimic the shape of the famous skyscraper’s observation deck, creating a picture-perfect view.